You want to use a new strategy for binary options? Strategy that requires the most serious preparation, and which is easy enough to learn? Strategy, the work which is simple, but effective, so she used and new traders, and those who have long mastered the binary options? Your choice may be trading on the news! What is the strategy based on the news? 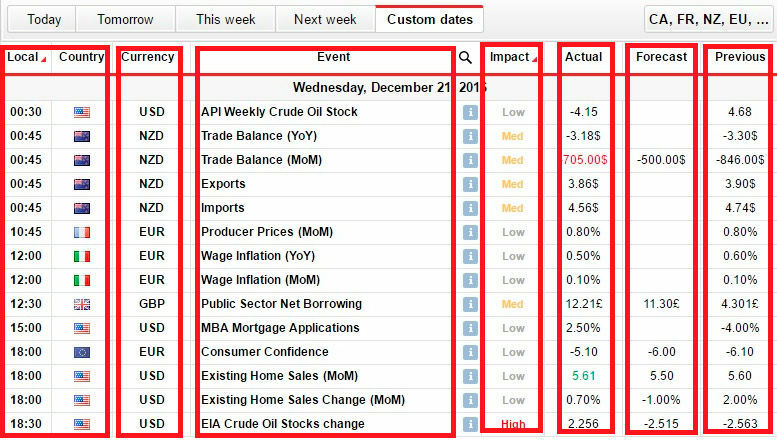 To use this strategy you need to analyze the economic calendar, choose the most important events, to understand how they affect the market - and open transactions in accordance with this influence. Sounds impressive: It must be difficult? Not at all! And now - a valuable theoretical knowledge (and, of course, display, how to trade on the news used in practice). Please note: The Economic Calendar is located right on this page. It is relevant, updated on-line, all the news correspond to the real situation. It is very convenient: the visitors of my website is now no need to search major economic news on the Internet, or to trust non-authoritative resource. Work with my calendar - and be sure not to miss any important information that might be useful in trading. Here is the page of the economic calendar. It may look a little different: any user, master binary options strategy, has the right to adjust the calendar, as it is convenient, for example, will automatically filter the events or to select the time and date. Calendar, which I use - and you can enjoy - provided by Investing.com. This is one of Russia's leading financial portals. I choose their calendar, because it is intuitive and easy to use for anyone who trades in binary options. So let's see, how does binary options strategy for trading on the news. To do this, we need to understand the degree of importance of specific data and the way in which certain indicators are reflected in the state of the market - and the success of the transaction. Note the screenshot. The first step is to work was really comfortable with binary options, let's make the necessary adjustment. To begin with, we note that your time zone, not to keep in mind the time difference with dozens of countries. To indicate at what time you live, get to your city list. If not found, find out how to close the city you have one and the same time, and select it. In the selection of such analogies also remember that practice time conversion to standard time in some countries, in others - not. Currency. Here it is displayed the currency, the value of which may rise or fall due to certain economic news release. Influence. One of the most important graph. It shows how weighty information, what is the likelihood that it really will cause a reaction in the market. In our calendar, notes the importance of the degree of the number of bull images (in other picture can be different, for example, stars, etc. ), the Bulls can be from one to three. The most important news - it three bull. It is on these binary options trader and is guided in the first place. Personally, I rarely pay attention to the news in the "two oxen" and do not pay - per. Only after three bulls with a high probability there will be a sharp increase or a sharp drop in the currency. Event. It briefly describes information on a topic published. The previous value (Prev.). This is the actual value of the news over the previous period (periodicity we turn to later, it too can be set in the settings). Weather. From this row, we learn what the actual value of the event, analysts predict. The actual value (Fact.). This is the current value of the index, which is considered news. The numbers displayed in this column can be red, green and black. It is on these data must first pay attention to the trader. Their interpretation of surprises can not be held. Red inscription - "shortage". The actual value was less than forecast. Green color - "bust". The actual value is higher than predicted. Finally, the black color printing corresponds to the basic color of the contents of the table. This means that there is nothing binary options trader to "profit": the actual and the predicted value of the same event or the same is not so significant that they are interested in, and analysts to make predictions that can then be used for operations on binary options strategies. What conclusions we do this? It's simple. We see on-screen, broker red inscription - immediately open the option for a fall. We see green - open the option to increase. We see black - do not open. Rather, we can discover something, but to predict the outcome will be much more difficult and much closer to that notorious "toss", which detractors sometimes compared to trade binary options. What are binary options it is best to open when trading currency pairs? Here is a list of the most popular couples with the corresponding solutions. Lest you get confused, give additional highlighting. GBP (British Pounds). Also works only with the euro and the dollar. Transactions are made on the same model as the euro. at red sell for a fall in the GBP / USD pair, GBP / EUR. at green color increase in the trade on the same pairs. JPY (Japanese yen). Pay attention only to its relationship with the US dollar. at red to increase trade USD / JPY. at green - Trade for a fall in the same pair. Note: here the red indicates an increase, and the green fall, because in the first pair costs a dollar, not the yen. This procedure is extremely important for trade: beginners should as soon as possible to learn it in order to avoid the loss of offensive tools. AUD (Australian dollar). Also we deal only in tandem with the US dollar. at red bearish in the pair AUD / USD. at green We need to carry out transactions to increase in the same pair. AD (Canadian Dollar). Of course, the currency is the US interacts with. at red bullish in the pair USD / CAD (yes, the situation is like the yen), while green color - A fall in the same pair. Trading on news based only on information from the calendar? No, there are other sources, and not less convenient and authoritative. So, my binary options traders are happy to use the data that they take from the "News"This site. There's not just a calendar of economic events are specified: it analyzes their importance and predicts which way to go of the asset. Following the advice of an experienced analyst, you can open the right options and significantly increase their profits! You probably care about very practical issues of application of "the news" strategy binary options. For example, at what time to open the binary options? Here all individually, but my practice options trading shows that the optimal time of expiration - two minutes. More - it is bad, because the situation usually changes very quickly. Less - it is possible, but difficult. Expiration per minute - an aggressive trade, it is suitable experienced traders and beginners who are not yet fully familiar with binary options, simply will not have time to navigate. Finally I will give you some specific tips that I personally have long been tested in practice - and continue to follow them. It's very simple tips, which, however, is often overlooked even beginners trade - and that can really make our lives easier! Select only the most important news. Three bull, at least two. But at the same time remember that the bulls bulls strife! Every trader knows that even if the news is marked by the highest level of influence, it does not mean that the market will react to it really. Usually, an understanding of what information is really worth, comes with experience. What if this experience itself a little more? This is why I opened a heading "News". There I publish, not all the news with three bulls, and only those that, in my opinion, can really help in committing bargain. Therefore, beginners binary options should not ignore this information. Do not chase after all the pairs, and choose the most convenient for himself. For example, I have focused on reports from several countries, opening in such cases, trading in certain pairs. Item about China is clear. The fact is that now, and Australia and New Zealand a lot of trade with China: this is their main economic partner. Therefore, the most important news from the Chinese market is almost always affect the cost of Australian and New Zealand currencies. Here we see that all the US news marked in green. Feel free to open a binary option on the rise. And in this picture all the important information from the US is marked in red. Accordingly, we can open the option for a fall. Immediately Japanese news contradictory half of "red", half of the "green". Do not assume that outweighs, not even worth to take into account the number of bulls. If there is a contradiction, a binary option is better not to trade. At once I will tell about one more situation when the option should not be opened. Now quite often there is such a situation: before the news there are still seconds left 20-30, and the market has already reacted to it, and violently. This is due to the fact that the stock exchanges try to foresee the situation: if positive data are expected, then the exchange rate will rise sharply ahead of time, if negative, then the cost will drop sharply before the news. Therefore, it can often be seen that immediately after the appearance of certain information the course is at the extreme point, and then moves towards the old value. Here in such moments it is better not to open a binary options deal, but to pay attention to another pair, in which new economic data did not cause sharp leaps. So how do you apply this binary options strategy in practice? I illustrate analysis of real work situation, which has recently happened in my practice. Trading on the news, I decided to focus on the United States: namely, several major news expected from the US market on the day. At the same time all the news gave us the red numbers, as in all cases, the actual value is not reached before, which predicted. Here's how it looks on a real screenshot. So, immediately after the appearance of information of interest to me, I open a binary option on the currency pair USD / JPY. Expiry Time: 2 minutes. Option type: a fall. As expected, after the news of the dollar against the yen began to decline sharply. Invested US $ 200, 344 I returned, that is, two minutes 144 earned dollar. See for yourself: here's a screenshot. This example shows that the binary options trading strategy on the news implies a very rapid response. The course falls sharply or abruptly increases immediately after the release of relevant information, and in a few seconds, the situation is changing, and open the option becomes not so profitable. Therefore, strive to ensure that the right to have time to react to an important signal. Do not waste your time will expose all desired settings before the start of trading. If you notice that do not have time to respond due to the fact that the computer does not pull: do not take the funds for "pumping" of his working tool. The main objective of any strategy binary options: increasing the amount on deposit. I have this full order - and I wish the same to you! And not just "wish": I support their customers, inviting them to trade at home chatting signals for binary options. If you want to carefully examine the existing trade binary options strategy, I recommend to start with corresponding article on my site. In another article I published full list I know the current trading systems for binary options. Would you like to earn options? All in your hands! Learn, practice, get new information and apply it to good use! Tool for trading binary options "Ladder"